On June 20-24, 2016 the African Organization for Standardization (ARSO) held its 22nd general assembly, hosted by the government of Tanzania through the Tanzania Bureau of Standards (TBS), in Arusha, Tanzania. As part of the event, the Standards Alliance and PTB worked with ARSO to develop a training session focusing on conformity assessment and its connection to trade facilitation. The training session entitled, “Implementation of standards for trade facilitation: Focus on conformity assessment systems” occurred on June 21. The session addressed vital aspects of the conformity assessment process to ensure that conformance procedures act to bolster confidence, protect consumers, and confirm product compliance without hindering trade. The general assembly included the participation from 25 of the 36 ARSO member states as well as various extra-regional international standards organizations. 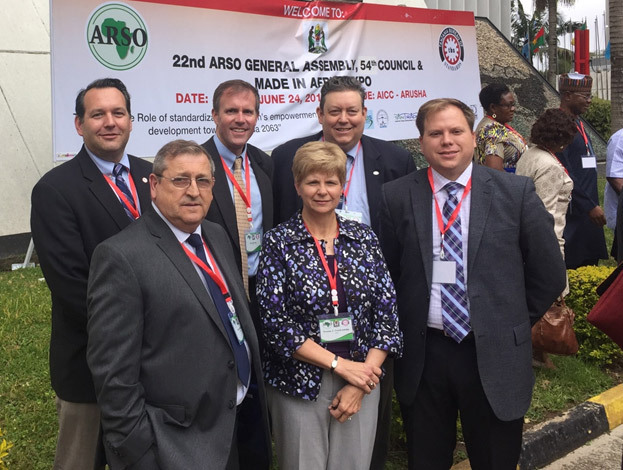 Several U.S. experts traveled to Arusha to participate in the event, including representatives from ANSI, ASTM International, IAPMO, Intertek, and UL. The principle mandate of ARSO is to harmonize African standards and conformity assessment procedures in order to reduce technical barriers to trade as well as to enhance the industrialization of Africa.